A group of researchers is readying for NASA’s Sept. 8 launch of a spacecraft to a near-Earth asteroid named Bennu, thought to harbour primordial material left over from the formation of the solar system 4.5 billion years ago. The main mission goal is to pluck a sample of rocks and surface soil from the asteroid, then return it to Earth for analysis. CU Boulder Distinguished Professor Daniel Scheeres of the Department of Aerospace Engineering Sciences is the team leader for the mission’s radio science team, which will use spacecraft tracking data to probe Bennu. The mission, called the Origins, Spectral Interpretation, Resource Identification, Security- Regolith Explorer (OSIRIS-REx), will launch from Cape Canaveral, Florida. After its two-year journey to Bennu, the spacecraft will make observations and measurements for the following two years, ending in the collection of a surface sample of up to 4 pounds of material. Other CU Boulder researchers from aerospace sciences involved in the mission include Assistant Professor Jay McMahon, Senior Research Associate Paul Sanchez, postdoctoral researcher Siamak Hesar and graduate students Daniel Brack and Samantha Rieger. CU Boulder is expected to receive about $3 million from NASA over the course of the mission. Scheeres and his colleagues will use the Deep Space Network (DSN), a group of large antennas and ground stations in the United States, Spain and Australia that support interplanetary missions, to help them measure the speed of the spacecraft. Scheeres and his team also will bounce periodic “blips” between the DSN and OSIRIS-REx, using the time lags to determine the spacecraft’s precise distance from Earth. In addition to its pristine nature, Bennu also was selected because it is fairly easy to get to, at least by space exploration standards, said Scheeres. 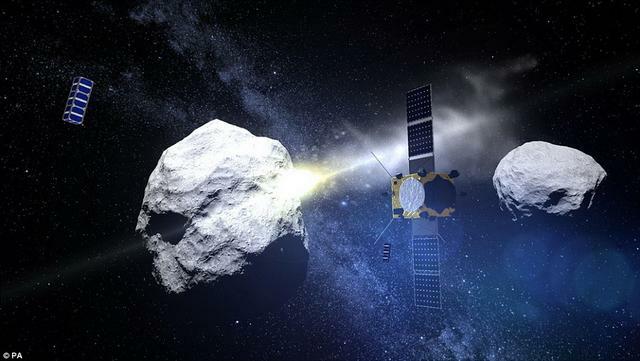 The spacecraft will fly roughly 1.2 billion miles, circling the sun several times over the two-year journey, including one flyby of Earth before catching up to and eventually nestling alongside the asteroid. Bennu is believed to be a rubble pile of primitive boulders, rocks and gravel as well as organic compounds like amino acids that are rich in carbon, Scheeres said. Scientists believe such compounds may have contributed to the evolution of life on Earth and are important factors in determining the potential for life elsewhere in the solar system. A third motivation to visit Bennu is the tiny chance it could smack Earth in the coming centuries. As a near-Earth asteroid, Bennu will cross Earth’s orbit in about 160 years. Bennu is roughly spherical with an equatorial bulge and has a diameter of about 1,600 feet – larger than that of the U.S. Pentagon building in Arlington County, Virginia. The mission has a strong Colorado connection: In addition to CU Boulder’s radio science role, the spacecraft was designed and built by Lockheed Martin Space Systems in Littleton, Colorado, which also will operate the spacecraft. OSIRIS-REx will be launched on an Atlas V rocket built by United Launch Alliance in Centennial, Colorado. In addition to the radio science equipment, OSIRIS-REx is carrying a suite of cameras, spectrographs, a laser altimeter for mapping and the Touch-And-Go Sample Acquisition Mechanism (TAGSAM). TAGSAM is a long, jointed arm with a collection box that will reach from the moving spacecraft to scoop up surface material that will be placed in a small, cone-shaped container that later will be launched back to Earth, arriving in 2023. Scheeres was also a project scientist on NASA’s NEAR-Shoemaker mission that visited the asteroid Eros in 2000 and the Japan Aerospace Exploration Agency (JAXA) Hayabusa mission that visited the asteroid Itokawa in 2005.